For the Mesopotamian god, see Anu. Not to be confused with Annan. In Irish mythology, Anu (or Ana, sometimes given as Anann or Anand) is a goddess. She may be a goddess in her own right, or an alternate name for Danu. In the Lebor Gabála Érenn, “Anand” is given as an alternate name for Morrígu. While an Irish goddess, in parts of Britain a similar figure is referred to as “Gentle Annie”, in an effort to avoid offence, a tactic which is similar to referring to the fairies as “The Good People”. As her name is often conflated with a number of other goddesses, it is not always clear which figure is being referred to if the name is taken out of context. This name may be derived the Proto-Celtic theonym *Φanon-. 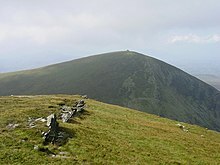 Anu has particular associations with Munster: the twin hills known as the Paps of Anu (Dá Chích Anann or the breasts of Anu), at 52°00′55″N 9°16′09″W﻿ / ﻿52.01528°N 9.26917°W﻿ / 52.01528; -9.26917, near Killarney, County Kerry are said to have been named after this ancient goddess. ^ a b R. A. Stewart Macalister. Lebor Gabála Érenn. Part IV. Irish Texts Society, Dublin, 1941. § VII, First Redaction. ^ Proto-Celtic—English lexicon and English—Proto-Celtic lexicon. University of Wales Centre for Advanced Welsh and Celtic Studies. (See also this page for background and disclaimers.) Cf. also the University of Leiden database Archived February 11, 2006, at the Wayback Machine. MacKillop, James. Dictionary of Celtic Mythology. Oxford: Oxford University Press, 1998: ISBN 0-19-280120-1.